OML 63 is located onshore along the coaster swamp area of the central Niger Delta, south east of OML 62. OML 63 is the largest of the NAOC JV Licenses in terms of acreage covering an area of 2,246 km² (554,998 acres). It is the second largest License in OER’s portfolio in terms of both production and reserves. Exploration in OML 63 began in the early 1970’s with the discovery of the Tebidaba, Obama and Ekedei fields. The Tebidaba field was developed in 1974 and became the main flowstation for the fields located on the western part of OML 63. Successful exploration has continued in OML 63 with the discovery of the Clough Creek field (1975), the Azuzuama field (1978), the Ogbainbiri field (1989), and eight other fields. To date, the License comprises eight producing fields. All of the producing fields in OML 63 contain both light and medium oil (16° to 45° API), gas condensate and free gas. 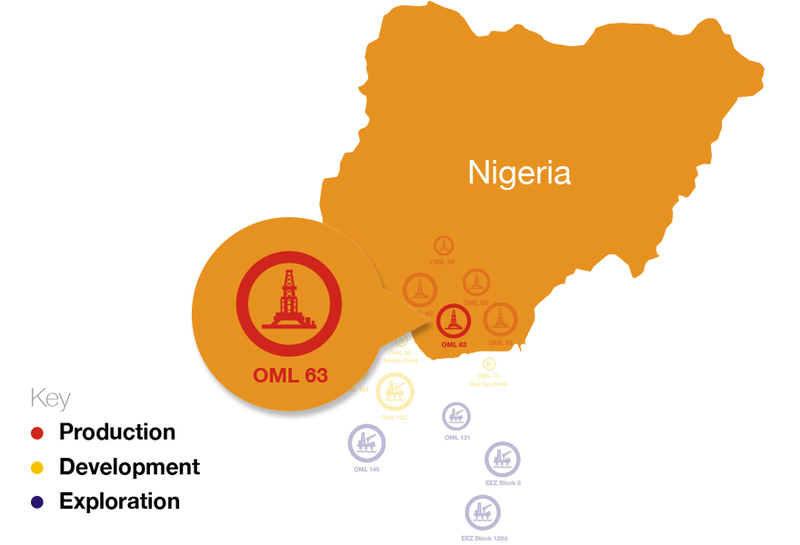 In addition to the eight producing fields, OML 63 has exploration upside, owing to the physical size of the License and the presence of under-explored macro-structures in the northern section. The current portfolio comprises four “drill ready” prospects and 16 leads. Ogbainbiri gas plant (capacity 200 MMscf/d), which was completed in early 2014.